Turn a cat into a kitten again with Kitty Boinks. This clever flexible tube toy springs into action and makes cats go wild. 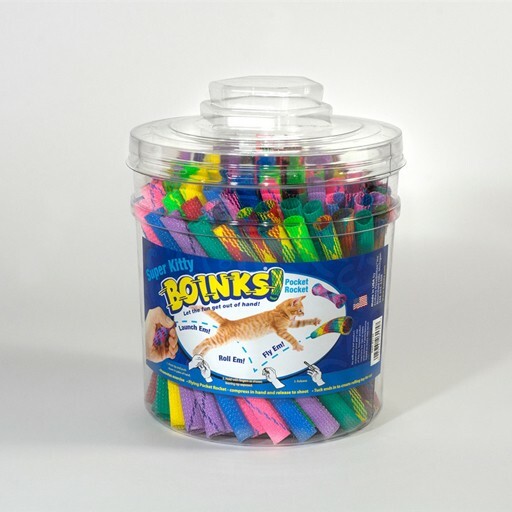 When compressed Kitty Boinks shoot up to 30 feet, providing cats with tons of exercise and excitement. Cats can’t seem to get enough of this colorful mesh toy. Two Ways to Play: Compress them in your hand and release them to shoot or tuck in the ends for a rolling toy. This flexible tube toy is durable, long-lasting and drives cats into a frenzy. It also promotes exercise, and is fun for both owner and feline.